It’s been an exciting year for research on Parkinson’s disease. In March, scientists from Stanford were able to recreate features of the disease in a petri dish using cells from a Parkinson’s patient. In June, we published a paper in PLoS Genetics detailing our discovery of two novel genetic associations with Parkinson’s. Now, we’ve also identified a genetic factor in a gene called SGK1 that may protect against the disease. This preliminary finding comes as a result of our innovative research and recruitment platform, which in just a few years has assembled the largest single genotyped group of Parkinson’s patients in the world. Of the 125,000 individuals in 23andMe’s database, there are more than 6,000 with Parkinson’s disease. Even more astonishing is the fact that we can collect large cohorts of people who share similar genetics, regardless of their health status. Most studies can only recruit individuals who have a disease, but our database allowed us to identify the world’s largest cohort of people carrying the G2019S variant in the LRRK2 gene. Roughly 1 in 10,000 people have this variant, which is associated with a 50% lifetime risk of Parkinson’s compared to about 1% in the general population. But within our database there are many people with this high risk variant who are at an age when they should have developed the disease but have not. By comparing these people to those with the variant who did develop Parkinson’s, we were able to discover the potentially protective nature of SGK1. Watch 23andMe CEO and co-founder Anne Wojcicki discuss this finding in conversation with WIRED editor Thomas Goetz at the Web 2.0 conference. Of course, none of this would be possible without our amazing research participants. Although we are well on our way to 10,000, we still need the support of thousands more to reach our goal. If you or someone you know has Parkinson’s disease, we encourage you to join the community. 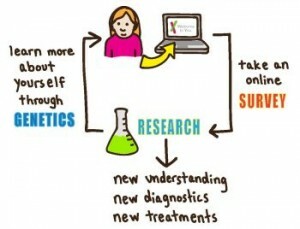 Participating is easy — just visit https://www.23andme.com/pd to get involved! This most recent finding is just the tip of the iceberg of what is possible when individuals come together to contribute to research. We continue to be inspired, not just by the progress we’re making, but by people like Paula, who are fighting every day with grace and courage and working towards making the world better for people with Parkinson’s.